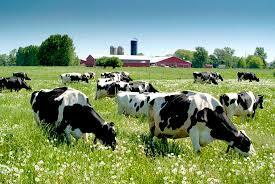 Organic Cows Feed in the Fields and Graze on fresh Grass. I Have questioned the Food industry and it's swing to all things Organic mainly due to the popularity of it, that has swept the USA for the better part of the past 15 years. There's a great Article on Grubstreet.com that is making this point for me, and more outlets like them. Read and watch the video. These places are scattered throughout the US for certain. So long as we follow the Marketing in the Food Marts Mega stores, and all of the other wanna be's we are being fed once again advertising that simply is not true, and paying twice as much for it.